Three days are required for all custom orders. Rush orders are available for an additional fee. Our Standard Vanilla and Chocolate with Crunch Cakes are available in stock for same-day pickup without a pre-order. Allergy Alert: Egg-free, Nut-Free, Gluten-Free cakes are available upon request. Please submit your inquiry via Contact Page and member of our team will reach out to you. 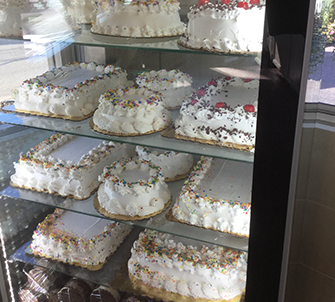 All of our custom cakes can be made with most of our hard ice cream flavors.